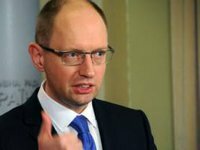 Ukrainian Prime Minister Arseniy Yatseniuk, who was elected chairman of the political council of the People's Front Party, has said he believes that the party has collected a strong team, and the country needs the unification of all democratic forces in the upcoming parliamentary elections. "The recipe for our victory lies in the unification and unity of all democratic forces. Our position is that two years ago, we united into the opposition for the sake of the country," he said at the first congress of the People's Front Party in Kyiv on Wednesday. He said that he does not have excessive expectations of the election campaign, as the elections will be held under the old legislation and oligarchs will get to the Verkhovna Rada. However, Yatseniuk said he believes in the future of the People's Front Party. "With this team, we will go further. We have formed a strong new team, where everyone is responsible for what he knows," he said.